Whether you are partial to loads of tomatoes or want a good cool weather crop, we have the collection for you. 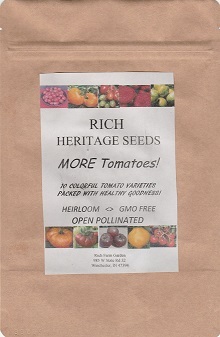 Each of our Garden Collections is comprised of the finest open pollinated Heirloom seed varieties prized for years for their vigor, dependibility and superior production. As always, our seeds are tested for superior germination and are fresh and of the highest quality. No GMO's and every seed is responsibly grown. 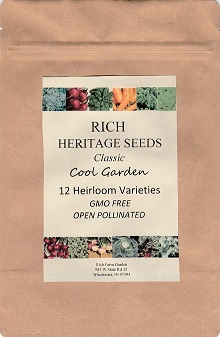 Each collection comes in a re-sealable lined kraft bag with breathable individual packets inside, so you can plant all of the seeds now, or plant some and store the rest for later. 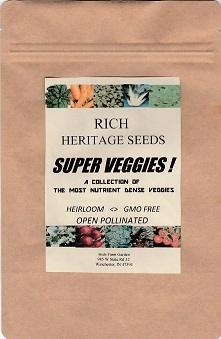 Each packet is labeled with complete planting instructions and variety information. These attractive pouches make excellent gifts for any gardener! The best varieties for a Fall/Winter/Early Spring garden, this collection contains 12 time tested favorites for highest production. For the true tomato connosuier, this is the ultimate collection of 10 wonderful heirloom varieties with a complete range of flavors, colors and sizes. Feeling adventurous? This is the collection for you. 10 of the most flavorful and spiciest chilis anywhere will add a kick to any meal. Our collection of a dozen of the most nutrient dense vegetables you can find. These amazing veggies contain a power pack of vitamins and minerals for a healthier you. Rich's Complete Garden Kits are the perfect choice for those who wish to prepare for the future or to begin seed saving in earnest. Every heirloom variety in these collections has been chosen for its adaptability and toughness and to allow maximum variety at minimal cost. Each Garden Kit consists of bundles of our standard seed packets or bulk packets, sealed in a metal storage container. Inside are all the seeds you need for a fabulous garden - or two. 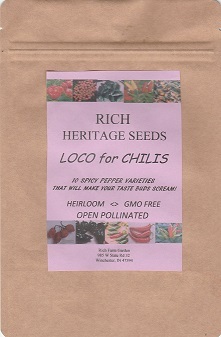 As always, Rich seeds are responsibly grown and are never genetically modified. Seeds stored in these containers will retain viability for an average of 15 years. We offer several different collections for large or small gardens and specific needs. See chart below for Number of seed packets and bulk seed quantities in each kit. Click individual vegetable or herb name for item description and packet seed count. We sell seeds by weight, by packets with specific seed count, and by Complete Garden Kits. Regarding the space requirements: We treat this just as 'MINIMUM REQUIRED'. Our recommendations for plant spacing can be found by following each of the variety links above. These recommendations are based on hand cultivation, walking between rows and hoeing. If you use machines such as tiller or tractor, you will need to calculate your own row and plant spacing. If you buy seeds based on ground space that can be filled, do not be surprised if the seller hermetically sealed enough seeds to drive a truck between the rows. We will be glad to help with these calculations, send your queries by email. Our #K5 Garden Kit will take approximately an acre of ground for all of the seeds, using space very conservatively. We like to recommend, as the most secure approach, that half of the seeds be used for a season's planting, and half be retained as contingency for harvest failure (be prepared is our motto). Thus one of the reasons that we use resealable cans: you do not have to commit to planting all of the seeds in the kit just because you wanted to open the can once. Another advantage to the resealable can is being able to check stock at any time, including initial cache. And mainly to be able to check for viability at a future date. For example, if a kit has been stored for 10 years, and you wish to store longer, you can open the can in a cool, low humid environment and remove samples of each seed lot in the can. Reseal, and test the seeds for germination. A seed needs a minimum moisture level to remain viable, and we suspect that a vacuum may not be best for long term storage. We take a cue from what we have seen of seeds that were propagated after ages in American caves and African silos. Some seeds will retain viability longer than others. 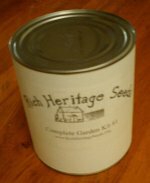 For more about relative germination of different vegetable varieties see: Seed VIABILITY - LONGEVITY On the outside label of the storage container is the harvest/pack date and a list of items inside. On the inside each seed variety is labeled with description and planting instructions.